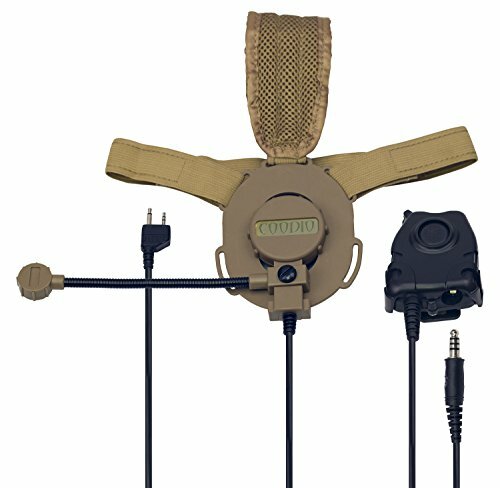 Coodio's 2pin Midland two way radio tactical heavy duty PTT headsets are optimized for communications intensive environments in which personnel need to interact with customers while maintaining radio communications. Removable swivel boom noise cancelling microphone is reversible for use with either ear, provides all-day comfort, excellent durability, reliability and performance in low-profile environment. Comes with a large tactical remote body PTT which is designed for use when wearing gloves and other heavy gear to provides hands-free operations when situations require. Excellent for user in police, military, nightclubs, bars, paintball, security, restaurants, hotels, bouncer, warehouses, party, building construction, stage, studio, hunting, outdoor and noisy environments. ONLY compatible with 2-Pin Midland jack portable GMRS/FRS handheld VHF/UHF walkie talkies two way radios(Midland X-TALKER, GXT1000VP4, LXT600VP3, LXT118VP, LXT500VP3, GXT1050VP4, LXT118...). If you have any questions about this product by Coodio, contact us by completing and submitting the form below. If you are looking for a specif part number, please include it with your message.